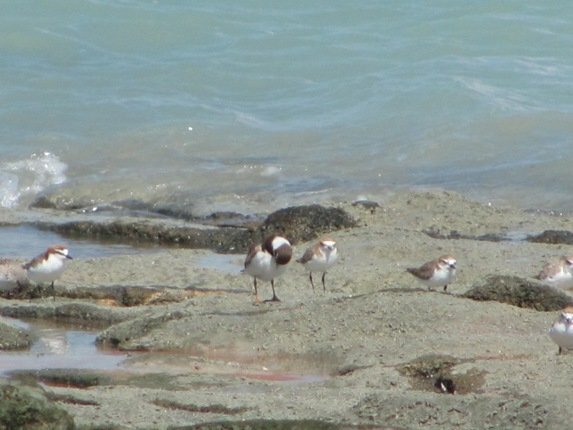 Semipalmated Plover in Broome….am I mad!? Isn’t that a bird that doesn’t venture “down under”….you are correct….or you were correct! 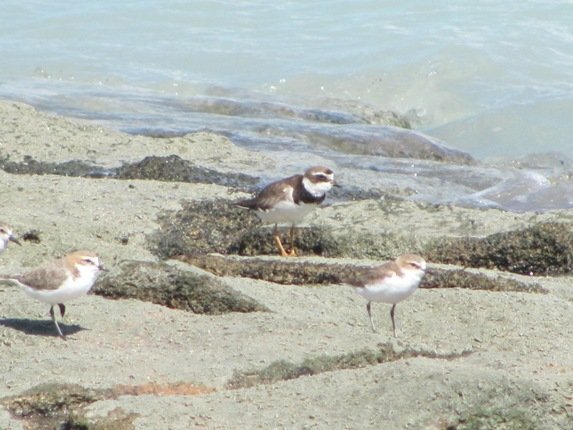 In late 2009 there was huge excitement in Broome when a Plover was observed at the famous Poo Ponds and was initially presumed to be a Ringed Plover, which is extremely rare, but not unheard of in Australia. Vehicles had their roofs dented as eager birders tried to get a view of the bird inside the Poo Pond fence line and photograph it and then identify it. It was finally declared a “first for Australia” and was seen regularly at the Poo Ponds for some time. It then chose to venture onto the local beach and could be observed amongst the Red-capped Plovers, Greater Sand Plovers and the Red-necked Stint. Birders flew to Broome to see this amazing little bird that had somehow got onto the wrong migration path as it headed south. We will never know which species it came with or which route, but this was a special bird. It finally seemed to have migrated this year after staying in Broome for over 18 months and we presume it went north to where it had originally started out from. Well, this week brought great excitement to us….it had come back! Whatever went wrong with it’s migration the first time round that brought it to our shores seems to have become embedded in it’s system and it looks like this is it’s southern home! There is ample food here for it, so why not make Broome home for several months each year….thousands of other shorebirds do! During our observation it spent a lot of time preening, so maybe it had only just got back. We had not seen it there the day before, but it could have been at the Poo Ponds. There were several people on the beach to go fishing and we didn’t want to scare it off, so the photos are from quite a distance, but there’s no mistaking our little friend from the north. It’s welcome here every year! Meanwhile the mango season is in full swing and we couldn’t reach all of the mangos and the latest bird thief after the Great Bowerbird and Little Friarbird have broken the skin is the White-gaped Honeyeater! I said I would let you know if we ever got the “chance of an afternoon shower”….well, we smelt that tropical rain, but it went around us! Isolated showers are a common event and it did rain only a few hundred metres from our home, but not at home yet! This weekend sees us head south for a few days to help with counting thousands of shorebirds along Eighty Mile Beach to see how the reclamation of mudflats in Asia is affecting their populations. The counts will be repeated in December as they should have all returned from the north by then. It’s a challenging task with the time limits around high tide, but you never know….we might come back with some really good sea snake photos to share!! Wow, talk about a vagrant bird! Awesome. It made it down. I’d given several of our Semi-palmated Plovers your address so I hoped that one of the bunch would make it there. There was one at Miranda near Auckland last year. Weird that people were more interested in it than the Wrybills. Why is it that the one shorebird in your post that excites me the least is the Semipalm Plover? 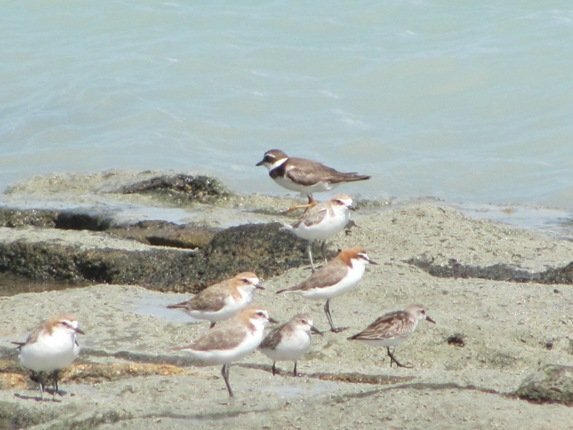 Red-necked Stints .. sigh! Oh, to find one in Germany! And Red-capped Plovers just look cool. And please, no more mango pictures, pleeeeeease!!! 🙂 Give us sea snakes instead. @ Pat-yes, it’s nice to have the odd vagrant! @ Clare-thanks for sending it! @ Duncan-vagrants bring out the real Twitchers for sure-don’t care too much about the bird itself, but it needs to be “ticked” in their life list! @ Jochen-look at this again & enjoy! 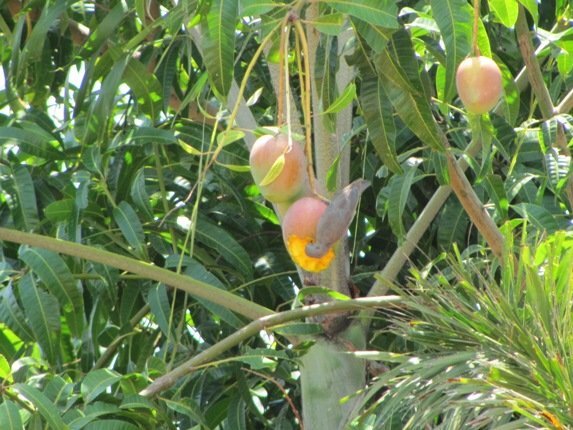 Not tired of eating mango yet….freezer is full also!